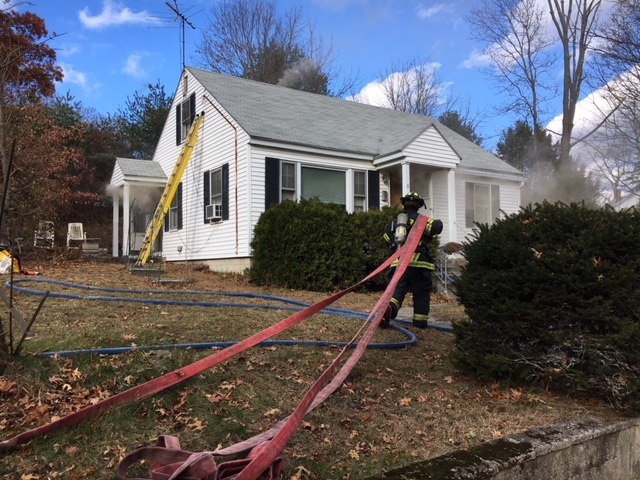 ANDOVER – Fire Chief Michael B. Mansfield says that the Andover Fire and Rescue extinguished a one-alarm house fire this afternoon. At approximately 12:30 p.m., Andover Fire received a report of smoke coming from a home at 11 Princeton Ave. Engine 1, 2 and 3, along with Ladder 1 and Car 1 and 2 responded to the scene. Upon arrival, firefighters saw heavy smoke coming from the 1 ½ story wood frame home. The two residents had exited the home prior to crews’ arrival. Firefighters located the origin of the fire in the basement, and extended two lines to make an aggressive attack. The fire was under control just after 1 p.m. The home sustained heavy heat and water damage in the basement and smoke damage throughout the interior. Damage is estimated at approximately $100,000 and the home is uninhabitable. No one was injured. During the incident, the North Andover, Middleton, Tewksbury and Lawrence Fire Departments provided station coverage. Firefighters remained on scene clearing hot spots until about 4 p.m. The cause of the fire remains under investigation by Andover Fire Rescue and Massachusetts State Troopers assigned to the State Fire Marshal’s Office.